J.D. Martinez #28 of the Arizona Diamondbacks hits a solo home run off Madison Bumgarner #40 of the San Francisco Giants in the fourth inning of the MLB game at Chase Field on August 26, 2017 in Phoenix, Arizona. PHOENIX — Madison Bumgarner was brilliant on opening day here at Chase Field. The Giants lost. Bumgarner carried a heavy load again Saturday in the park where he hit two homers the last time he took the field. The Giants again lost. — The Giants didn’t have a baserunner until there were two outs in the fourth. Technically, Jarrett Parker didn’t spend much time on the bases. Parker broke up the modest no-no/perfect game with an absolute blast to dead center that got 97 feet up in the air and traveled an estimated 441 feet. 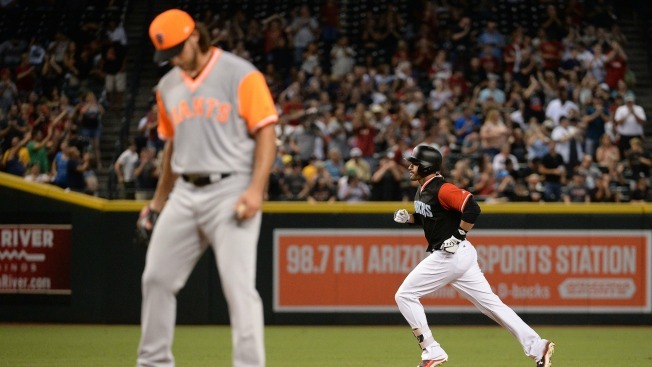 Aesthetically, it was one of the more impressive homers of the season for the Giants. — With two on and two down in the seventh, Bruce Bochy let Bumgarner hit for himself against lefty Andrew Chafin. Bumgarner struck out looking on a pitch that was way outside. — Bumgarner allowed just two runs, dropping his ERA a tick to 2.85. Both came on solo homers. He struck out seven and walked just one. — David Hernandez, cut by the Giants back in March because Neil Ramirez looked better, pitched a clean eighth. He has a 2.62 ERA and 0.99 WHIP this season. Oops! — It was 110 degrees outside at first pitch. The roof was closed, but still, feels like this is worth noting. People live here.